LIVINGSTONE, Zambia, May 6 2016 (IPS) - Merian Kalala, a farmer in Solwezi, capital of the North-Western Province of Zambia, knows firsthand that climate change is posing massive problems for agricultural productivity. With its negative effects already being felt through floods, droughts, early frosts and increased incidences of pests and diseases, the Intergovernmental Panel on Climate Change (IPCC) predicts an increase in the frequency and intensity of such severe weather events across the globe, threatening to reverse global developmental gains. Although it falls at number 13 on the list of Sustainable Development Goals (SDGs), climate change is now being described as the greatest development challenge of the 21st century. Kalala hails from a region that gets normal to above-normal rainfall annually, but she understands the stress that her fellow smallholders affected by drought are going through, and believes the latest technology and innovations as highlighted at the World Farmers’ Organisation (WFO) General Assembly in Zambia this week could be crucial to tackling the challenge. “Climate change is a serious threat to agriculture. I know how challenging it is for our colleagues in drought-prone regions of the country. It’s about time we embrace water harvesting techniques to deal with the drought situations that have become more prominent in recent years,” Kalala, who chairs the District Farmers Association, told IPS. She also thinks an integrated approach where farmers have a guaranteed access to finance, insurance and markets could be a solution to climate change impacts. “With insurance, smallholders are assured of some returns in case of disasters,” said Kalala, whose association is on the verge of signing a financing agreement with NATSAVE and MFinance to grow soya beans with a market access guarantee. Globally, agriculture directly accounts for 13.5 percent of greenhouse gas emissions (methane from animals and nitrous oxide from agricultural soils) and another 17 percent indirectly through deforestation and land use change. However, it is also a crucial part of the solution through implementation of efficient climate-smart agricultural practices. This was the argument that the farmers’ constituency, led by the WFO, advocated for at the COP21 climate talks in Paris last year, where they achieved the inclusion of a reference to ‘food productivity’ and ‘food security’ in the agreement. COP 21 gave the world a binding agreement that is seen as a pillar on which to build the fight against climate change. Nevertheless, the agreement is not the solution; it is a start towards the solution, in which farmers see themselves as agents of the solution—a sub theme that has been discussed here at the WFO General Assembly. Sok Sotha of the Cambodian Farmer Association Federation of Agricultural Producers says farmers could be agents of the solution to climate change through capacity building. “Farmers lack knowledge such that even if they are exposed to latest technologies, they don’t know how to apply them for their sustainability,” observed Sotha during a presentation on how agriculture can be turned into a solution to climate change. With the African agricultural sector employing 65 per cent of the coninent’s population, half of whom are women, the New Partnership for Africa’s Development (NEPAD) is supporting the implementation of climate-smart agriculture in Africa, targeting the goal of 25 million African farmers practicing it by 2025. The biggest question now is still financing. According to the Pan African Climate Justice Alliance (PACJA), a consortium of environmental civil society organisations in Africa, the COP 21 Agreement is elusive on finance. “The Paris Agreement only commits to mobilizing 100 billion dollars per year by 2020, not just for emission cuts but also adaptation. This is far short of the support required, and there is no firm commitment to increase this figure,” reads part of the PACJA analysis. The civil society group, Africa’s forerunner on climate justice, warns that the use of the word ‘mobilise’ in the agreement is purposefully intended to include loans, grants – which usually come with strings attached – and re-allocation of aid budgets. As the WFO General Assembly closes, the question of building strategic partnerships for growth has been raised and delegates hope that farmers would be placed at the centre of the world’s development agenda. Addressing the assembly on Friday, May 6, Zambian President Edgar Lungu stressed that the world must not leave farmers behind in its quest to achieve sustainable development. “ZNFU [the Zambia National Farmers’ Union] uses a slogan which says: No Farmer, No Food, No Future. Indeed, without farmers there would be no future on this planet…We all need food, including presidents. 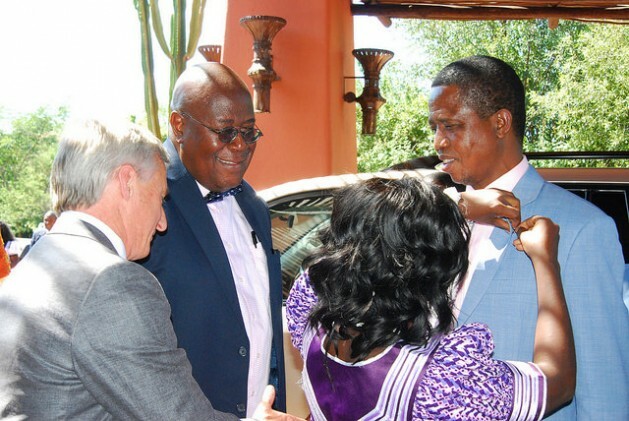 I also eat,” said President Lungu during his keynote speech to the WFO.